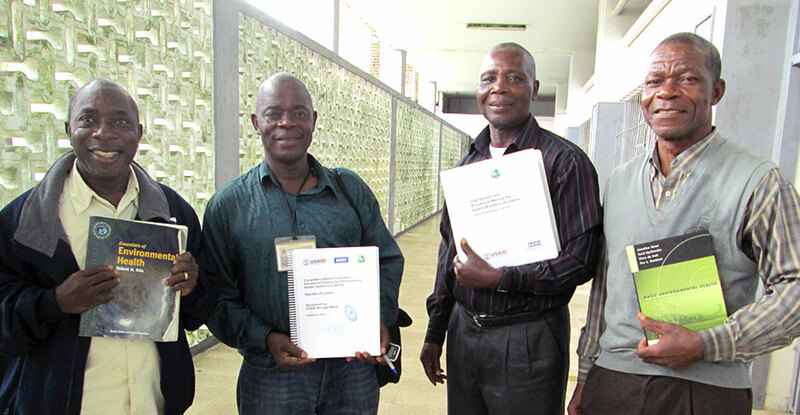 Kerkulah Kollie (second from left) stands with colleagues, displaying their updated training materials. 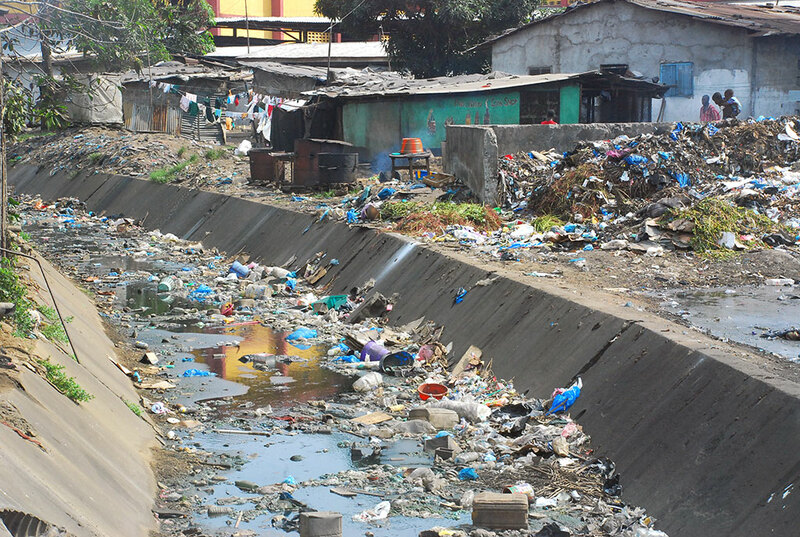 Monrovia, Liberia—Every day on Kerkulah Kollie’s way to work, he passes communities throughout this capital city that have limited access to safe drinking water, open sewers and haphazard piles of trash. As director of the School of Environmental Health Technicians at Tubman National Institute of Medical Arts (TNIMA), Kollie knows keenly the responsibility he and his students share in ensuring communities benefit from effective preventive and innovative strategies that protect the health of Liberians from environmental hazards. It’s a challenge complicated by years of neglect due to the country’s civil war. In the past, environmental health technicians (EHTs) operated primarily within communities, teaching aspects of health, hygiene and sanitation, waste management and food safety. In part because their work was disrupted by the civil war, there have been serious declines in health indicators, especially for pregnant women and children. Illnesses such as preventable diarrhea, intestinal infections and malnutrition can be linked to unhygienic practices, poor infection prevention and environmental exposures. 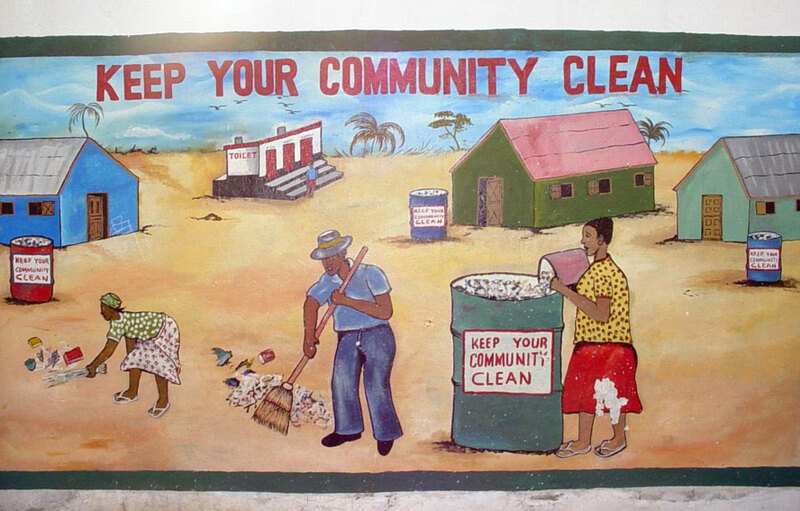 An example of Liberia’s challenges in waste management and sanitation. Even with current trends showing an improvement in clean and safe drinking water in the country, Liberia still has a long way to go to meet Millennium Development Goal 7—to ensure environmental sustainability—especially in regard to improved sanitation. Currently, only 44 percent of the population (27 percent in rural areas) has access to improved sanitation, and waste management continues to be a persistent challenge. But with the support of the U.S. Agency for International Development’s Rebuilding Basic Health Services (RBHS) project, environmental health has become a national priority for the Ministry of Health and Social Welfare (MOHSW). Through the RBHS project, which is led by JSI Research & Training Institute, Inc., with technical assistance from Jhpiego, the curriculum at the School of Environmental Health Technicians has been revised based on a task analysis of the primary duties of an EHT. In addition, the MOHSW has designated EHTs as the preferred supervisors for all community health activities, with responsibility over community health volunteers and workers. With Jhpiego’s support, training materials—as well as educational materials dating to the 1980s—have been updated, the skills lab properly equipped and clinical training opportunities improved. These changes have significantly strengthened the school’s role in developing the next generation of EHTs in Liberia. Message to the community about cleanliness. The RBHS project has been working with the MOHSW, educators and other stakeholders to strengthen the government’s capacity to educate and deploy its health workforce in alignment with its essential package of health services (EPHS). In the process of strengthening the EHT training program, the RBHS project brought together many key government ministries and nongovernmental stakeholders in Liberia as well as other capacity-building programs at TNIMA and other training institutions to enhance the quality of the EHT program and the hands-on learning of students. This cross-fertilization has improved the clinical experiences of EHT trainees. “Through this process, RBHS led the way in enabling the MOHSW to realize the importance of environmental health in quality health care and its role in community health, infection prevention, sanitation and waste management at the community and health facility levels,” said Kollie. The project has not only helped Kollie to better manage his classroom but has also built his self-confidence as a teacher. RBHS has “transformed my career by introducing me to computers; I’m now a professional and independent teacher using modern technology,” he said. Cheng et al. 2012. An ecological quantification of the relationships between water, sanitation and infant, child, and maternal mortality. Environmental Health, Volume 11.